The FIA takes its apolitical position very seriously. When Turkey tried to use the weight of the Istanbul Grand Prix to give credence to the almost completely unrecognised state of Turkish Cyprus, the FIA slammed Turkey with a $5M fine - a kick in the wallet so hard that the organisers had to sell the race to Bernie just to carry on. The reasons for this are simple enough to understand. The FIA can't be seen to use its many international events as leverage in political situations, whether by promoting or resisting the politics of the people it works with. While Mr. Ecclestone offers his racer to any rum customer with a pocket full of cash and threatens to withdraw from countries who don't have enough money or shiny enough pitlanes, the FIA cannot use its power in this way. World politics are not within its domain and it prevents itself from corruption by staunchly keeping well out of it. 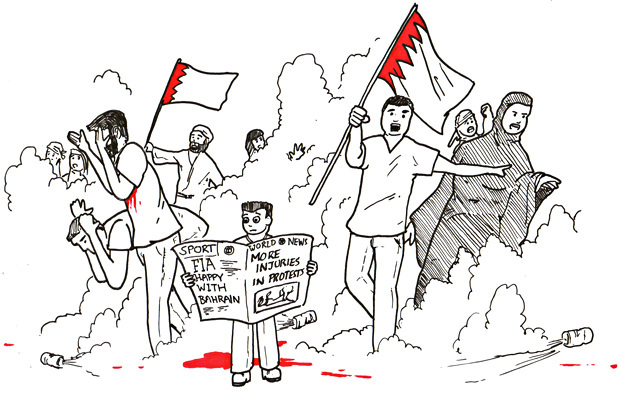 Unfortunately, in the case of Bahrain, F1 found itself in the middle of a political crisis thoroughly by accident. We were all scheduled to go to a peaceful Kingdom when the suddenly inspiration of the Arab Spring caught the attention of its oppressed numbers and, in their desperation, violence took hold. Naturally, we stepped back at this point, declaring the situation far too dangerous and far too inappropriate for our multi-million dollar games. And at this point, F1 was in a very good position: a position we really should have stayed in. Bahrain is in the middle of a violent humanitarian crisis. While the official "crisis" status has been withdrawn by the government, the protesters are still active and while their cause remains unresolved the protests will continue. F1 brings a huge entourage along for the ride. Team personnel, media, and fans all have to expose themselves to the potential violence on the streets of Bahrain. Their safety needs to be considered. Having F1 in town gives a focal point for violent action, especially as the event appears to be a kick in the teeth to the protests that remain ignored. With F1 having taken Bahrain out of the championship, it was in the perfect position to keep things that way until the pointed conflict had unquestionably quelled. Unfortunately, after a (frankly, lazy) review of the situation by the FIA, they declared the country fit for international sport and put the F1 race back on the calendar. The immediate international response was that of outrage and ridicule. Sadly, large organisations like FIA and FOM carry a lot of pride around with them and are incredibly reluctant to admit they made a wee bit of an error. Now, changing their mind again would look even more political than if they'd just left things alone. So now we have to sit through a lot of finger-pointing and arm-waving until everyone agrees it was everybody's else fault. But as long as everybody agrees this whole Bahrain race is a bad idea, I don't really mind the waffle.